Marty (1955): Dir. Delbert Mann. Written by: Paddy Chayefsky. Based upon his teleplay of the same name. Starring: Ernest Borgnine, Betsy Blair, Esther Minciotti, Joe Mantell, and Jerry Paris. Unrated. Running time: 90 minutes. A screenwriter who became a household name, Paddy Chayefsky first gained notoriety with this 1955 story of a working-class man. It’s a simple story, emphasizing dialogue and acting above all else. Ernest Borgnine plays the eponymous character, a self-described fat ugly man, and an unlikely romantic lead. He’s 34 and he ought to be married, as everyone seems keen to remind him. At a popular ballroom, Marty strikes up a conversation with a young schoolteacher, recently shrugged off by her jerk of a date. They might not be the most photogenic of couples, but that’s okay with Marty. “We ain’t such dogs as we think we are,” he assures her. 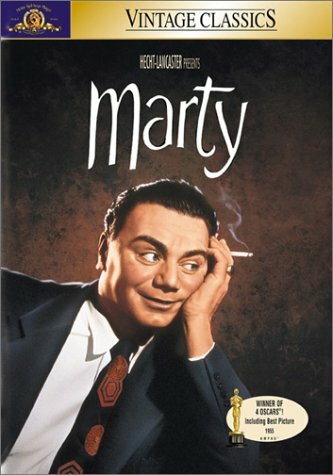 Like the anthology dramas of 50’s television, Marty represents a story about the common man (if Death of a Salesman is the common man on an epic scale, Marty is the common man on the common scale). It also means the film doesn’t overreach, and reveals the psychological and emotional turmoils of its characters–Marty’s joy at having found a companion, the quiet jealousy of his best friend, and the anxiety of his mother faced with a possible empty nest, to name a few. Chayefsky and director Delbert Mann really admire and empathize with their characters. Mann uses slow zooms on Marty’s face at key moments—such as his early rejections by female heartbreakers. True, Chayefsky was still developing his craft; his deliberate script seeks out every nuance of dialect it can, sounding accurate at times and forced at others. Of course, it helps that Borgnine plays the part as if he were meant to play it. All in all, I’d classify Marty as a slight but not inconsequential film. If nothing else, it proves that ordinary lives can deliver a satisfying cinematic experience, if handled by the right filmmakers.